April 25, 2013: EUROPE’S largest military exercise was forced to cancel yesterday after three whales stranded on an Easter Ross beach in Scotland. War games that had been due to take place near Portmahomack (Dornoch Firth) as part of Exercise Joint Warrior were halted to avoid distressing the pilot whales, which had stranded overnight. Fears were raised that the exercise may have been to blame for the beaching. However, according to the Seaquake Hypothesis advance by the Deafwhale Society, Inc., these 3 whales, and likely more, were injured a month earlier by two undersea earthquakes that ripped apart the seabed about 2,500 km upstream from the stranding beach. The quakes occurred along the undersea volcanic mountain range known as the Reykjanes Ridge, 1162 km southwest of Reykjavik, Iceland. The area is a well-known habitat for long-fin pilot whales. The two shallow-focused quakes, one and one-half hours apart, caused the rocky bottom to bounce up and down violently for about 30 seconds. This jerking (piston-like) motion generated a series of rapid and excessive pressure changes (aka: seaquakes) above the epicenter. The fast changing pressures in the water induced a barotraumatic injury in the cranial air spaces of the diving whales. Barotrauma is the most common injury suffered by scuba divers. The resulting barosinusitis disabled the biosonar system of the pilot whales, and rendered them as lost at sea as a blind sailor cast adrift in a row boat without a compass. Unable to dive and feed themselves due to extreme pain, and unable to echonavigate the open ocean, resistance to the flow of the current turned the whales and pointed them downstream into the path of least drag. Said differently, ocean currents, the exact same energy that carried each grain of sand to build the beach at Portmahomack, was the same energy that guided the lost whales thereto. As is clearly visible in the video linked above, the wind was blowing the surface currents directly to the beach. With no sense of direction of their own, the whales simply swim along with the flow until their bellies hit the sand. 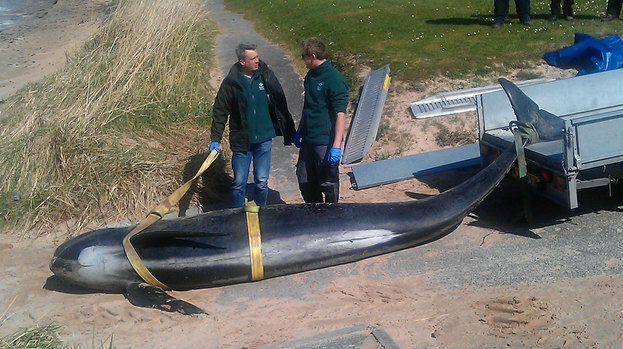 The two that were pushed back off the beach stand little chance of recovery. At least their carcasses will go to feed other deserving marine critters, including the sharks. Multiple earthquakes are often associated with beached whales. It is thought that repeat exposure is more injurious than a single exposure. The second larger event was also a thrusting earthquake that would send vertical traveling ambient pressure changes directly upward. 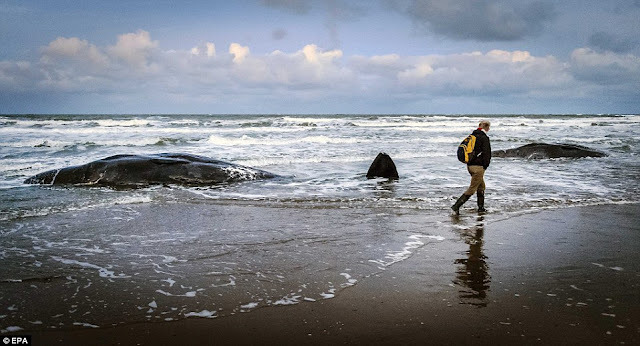 Whales are thought to be able to detect major earthquakes days before the main shock; however, lessor events that occur without precursors often catch them by surprise. It is also thought that several hundred years ago seaquake injured whales were more likely to recover before they beached. The key to this recovery was being able to feed during the healing process; any easy task during the 1700s and 1800s when massive schools of small fish littered the ocean's surface. All the pod had to do to catch an occasional meal was swim into one of these tightly-pack schools with their mouths open. But everything is now changed. Man's purse seining factory ships have stripped away all this low hanging fruit. Now, with little food on the surface, seaquake injured pods are no longer recovering. Mass strandings have increased alarmingly, and the numbers of individuals in each pod has dwindled to an all time low; a sure sign that our generation may soon witness the last mass stranding on Earth. Seaquake injury alone is likely enough to deplete the breeding stock and cause the collapse of the offshore species.